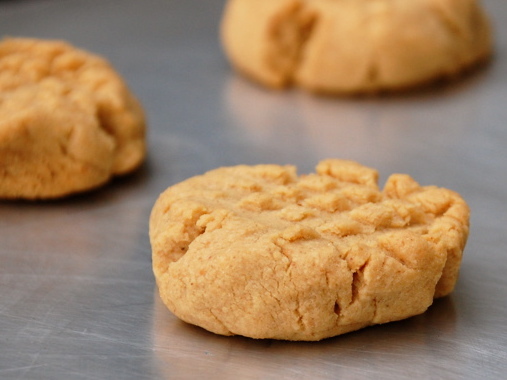 Lots of peanut butter makes for an intense peanut-butter flavor in these crumbly, melt-in-your-mouth cookies. In a mixing bowl, cream together peanut butter, butter, and brown sugar until well combined. Mix in egg and vanilla. In a small bowl, whisk together flour, baking powder, and salt. Add flour mixture to peanut-butter mixture. Roll dough into balls about 1 tablespoon in size. Place balls 2 inches apart on parchment-lined baking sheets. Press each ball twice with a fork (at 90-degree angles) to mark with tines. Bake 10 to 12 minutes, rotating so that cookies bake evenly, until cookies are light golden-brown. Let cool for at least 5 minutes before transferring to cooling rack. Cool completely before transferring to an airtight storage container.